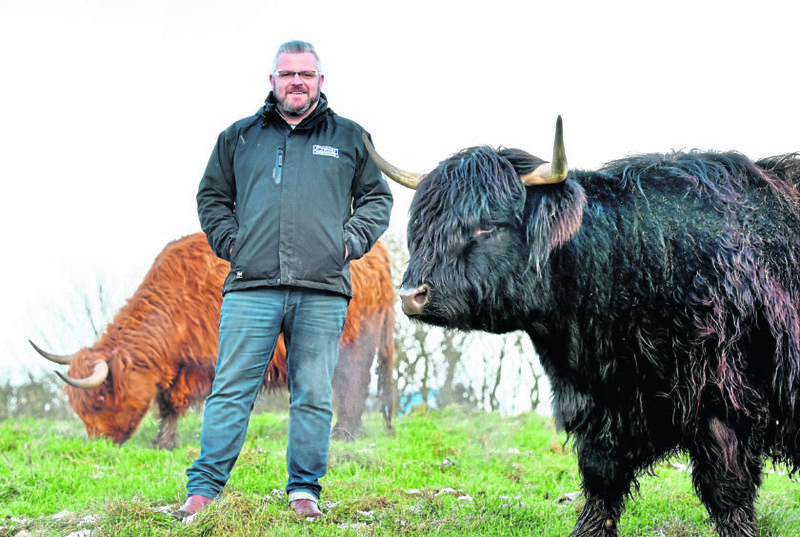 Farming Journal - Peterhead - Farmer Craig Finnie with his herd of Highland Cattle. PS there were only the cattle in the field and no rosettes etc. Picture by COLIN RENNIE January 29, 2019. 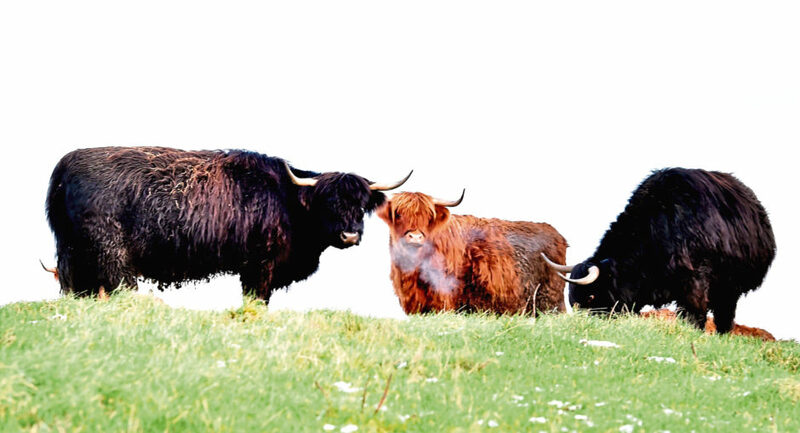 Highland cattle breeders from the UK and overseas are gearing up for the annual February two-day fling at Oban, where the very best of the breed is put on show and sold through the auction ring. The event, which kicks off with the show tomorrow, has attracted the largest entry for several years, with a total of 55 bulls and 70 females on offer. Also forward for the following day’s sale is a record entry of 12 black Highland bulls and a draft consignment of 13 in-calf heifers from Iain and Sheena Graham’s Killochries fold. One exhibitor busy preparing their entries is north-east breeder and society council member Craig Finnie, who runs his Richmondhill fold alongside the family’s Finnie 4×4 vehicle sales business at Peterhead. Farmer Craig Finnie with his herd of Highland Cattle.<br />Picture by Colin Rennie. Craig grew up with Highland cattle at the farm adjacent to his grandparents and was always eager to get involved with the breed – but never did he think he would be running a 24-cow fold 15 years later. The fold was established in 2004 when Craig bought two pedigree heifers from the Cnoc fold at the Royal Highland Show as a part-exchange in the sale of a Nissan Navara King Cab pick-up. He then purchased two heifers from the Ardbhan fold and in 2006 paid 5,000gn for Connachat of Greybrae. Like many other breeders, Craig believes people should be made more aware of how efficient Highland cattle are. 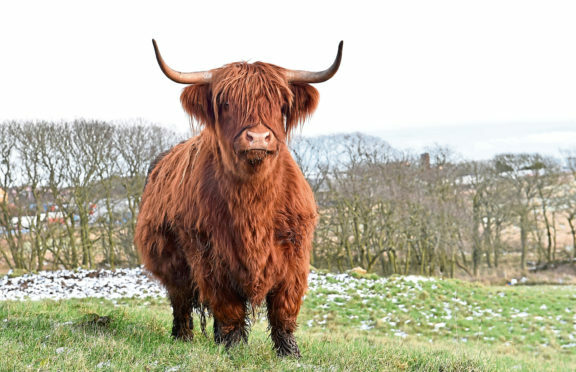 He said: “Highland cattle get dismissed as a hobby breed, but they cover all bases and can be crossed well with other native or continental breeds. Craig’s cattle are outwintered all year round and survive on the harsh, salty cliffs of Boddam and Longhaven, on the edge of the North Sea. The North of Scotland Highland Cattle Club held its 25th Anniversary Show at the Black Isle Show 2018. The champion was “Philip of Richmondhill” from Craig Finnie, Richmondhill House, Peterhead.<br />Picture by Ron Stephen. Cows calve outdoors from March onwards and receive hay and silage, with mineral buckets given on the run-up to calving. “The Highland cattle breed is probably all that would stand up to the weather conditions here,” said Craig. Not only does Craig favour Highland cattle for their strong maternal instincts and easy calving, but he also remarked on the breed’s longevity trait. Quality in the fold has been continually improved with the use of the home-bred stock bull, Charles of Richmondhill, bred from one of the fold’s foundation females, Banarach of Cnoc. He is sire to most of Craig’s show winners, including the April 2016-born bull Philip of Richmondhill, one of the fold’s entries for Oban. He stood champion at last year’s Black Isle and New Deer shows. 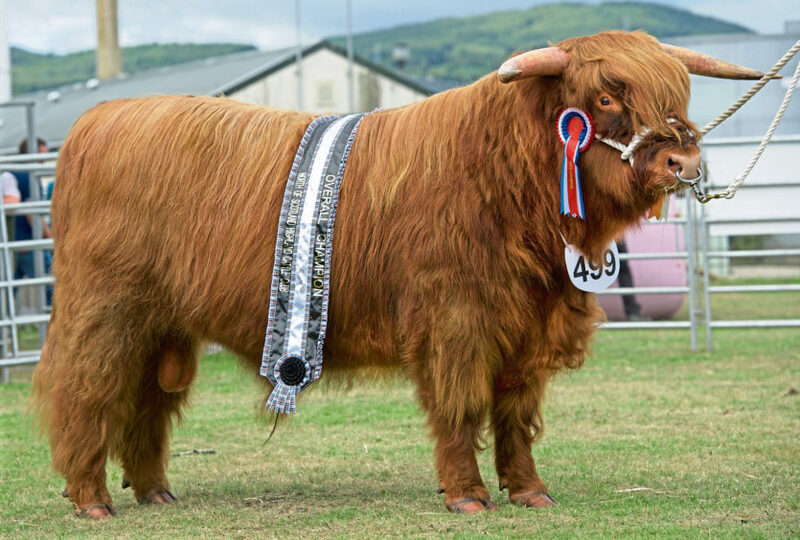 The other entries for Oban include two yearling bull calves which are sons of the other stock bull in the herd – Rod of Richmondhill, bred from a Glengorm female. Just recently, Craig went down the commercial route and crossed plainer Highland heifers with the beef shorthorn bull Ballinney Emblem. He said: “The amount of grazing we get each year varies so I wanted a breed that would allow me to sell stock quicker. The first batch of six Highlander cross shorthorn stots were finished at 19 months of age and averaged 265kg when sold to Millers of Speyside. “I’ve kept the Highland cross heifers and plan to cross them with a Limousin so that I’ll hopefully have a decent cow and calf unit to sell.